Twitter. Its Glory Days Are Over. Or Are They? Sunday, March 21 marks Twitter’s fourth birthday. Happy Birthday! But does Twitter have what it takes to continue its growth? I have some doubts. Twitter is not that special anymore. Facebook is replacing so many functions that made Twitter popular in the first place: Most of the socially active people can be followed in Facebook just as easily. You can respond to them privately or publicly and its even easier to share pictures and videos. Active Twitter users might not be that active inside Twitter after all. You can post 1+ tweets a day, but it does not require your presence anymore. Status updates can be automated, scheduled and links to articles require only few clicks from the blogs. Most of the tweets are links to articles anyway. Twitter is losing the genuine interaction between users. Twitter is not that exiting to regular people anymore. I hope, that in the future Twitter wouldn’t be just a playground for social media fanatics. To avoid this, Twitter has improve. Here is my selection of Loic Le Meur speculations, that may help to save Twitter from its slow death, IF they will be realized. 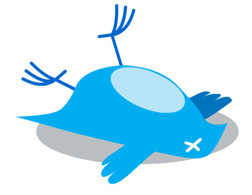 Twitter will still be dominant in status updates – it’s the motherboard on which we plug in. Also, Twitter has an enormous potential to be the fastest news channel. Most news will reach Twitter before they reach the News anyway. Lets cross our fingers and see, what we have to say about Twitter on its 5th anniversary. Next story Twitter Reduced The Rate Of Spam Tweets Ten Times.